Organizations in ever-changing environments depend upon their knowledge, as their survival depends upon effective thinking and agile actions. Any organization’s knowledge is its prime asset yet its true value requires the activations of structure, query, search and decision. 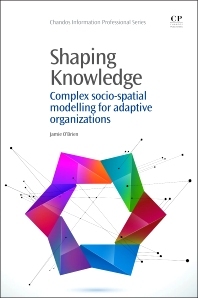 Shaping Knowledge provides an introduction to the key tools for thinking required by decision-making professionals in today’s knowledge-intensive landscapes, and equips them with key skills to capitalize on knowledge resources. This book provides practical methods and critical insights for modelling knowledge-driven domains, providing a rich resource for exploration in professional development and practice. The book is aimed at a diverse, albeit high-level, audience and would appeal to knowledge managers, interaction designers, urban designers and media and communications developers. Jamie O’Brien is Research Manager at University College London (UCL) Virtual Environments, Imaging and Visualisation (VEIV), a multidisciplinary research and training centre. Jamie has held positions at the British Library of Political and Economic Science and a leading museum’s education department. He holds a PhD in engineering. Jamie is also a Research Associate at the UCL Centre for Digital Humanities, Visiting Fellow at the Centre for Mobilities Research, Lancaster University, and a Fellow of the Royal Society of Arts, UK.